In my previous blog, Avoid the Four Horsemen, I discussed details of Dr. John Gottman’s Four Horsemen of communication: criticism, contempt, defensiveness, and stonewalling. When these four communication styles were witnessed within a couple, Dr. Gottman’s research was able to determine they can be predictive indicators of the end of a relationship. Although these four communication styles were a predictor of the end of a relationship, recognizing that the Four Horsemen are a part of your communication is the first step in reducing them. When the urge to engage in the Horsemen comes up, the next step will be to challenge the Horsemen with their antidotes. When we are holding our partner in contempt, we are blaming them, disrespecting them, and attempting to maintain a “superior” role. In order to challenge this, we must begin building this culture of appreciation. According to Dr. Gottman, this means to “remind yourself of your partner’s positive qualities and find gratitude for positive actions.” Too often, we can catch ourselves being innately negative about everything our partner does or does not do. This needs to be challenged, by creating a more positive narrative about who our partner is. Dr. Gottman also encourages couples to have five positive interactions for every one negative interaction, called the “5:1 magic ratio” to confront opportunities for contempt. When someone addresses a complaint or a criticism to us, we almost immediately want to be defensive, or provide an excuse as to why we did or did not do something. Unfortunately, that is not helpful, as it invalidates the person’s experience, and could potentially blame them for the problem they presented. When feeling defensive, attempt to use the antidote and take responsibility for the complaint. For instance, with the trash example, if your partner complains that you did not take out the trash, attempt to say, “we did have this conversation yesterday and I did not follow through, I will do it right now.” This will acknowledge your partner’s experience, and you are taking responsibility, which will likely diffuse the situation. When we are stonewalling, we are attempting to checkout either emotionally or physically. When self-soothing, we are challenging ourselves to stay present in the moment to avoid checking-out. Dr. Gottman states that this will include taking a break from the conversation, while communicating to your partner how much time is needed. During the break, self-soothing can be accomplished with coping skills such as grounding techniques, distracting techniques, or doing something that will help you be more equipped to come back to the conversation. 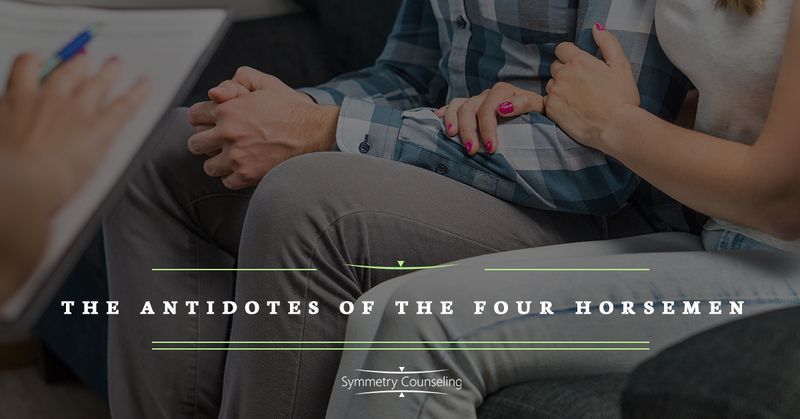 If you are recognizing any of Dr. John Gottman’s Four Horsemen of the Apocalypse in your relationship, and are struggling to implement the antidotes, it may be helpful to connect with a therapist. Contact Symmetry Counseling to get connected with one of our talented clinicians. The majority of the information used for the blog was found on the Gottman Institute website.